The favourite modification with 12 metre coaches is to convert them from 53/57 seats to maximum capacity 70 seaters. We fit 70 new Cogent 3 point belted seats using a 3 + 2 configuration (as shown below) across the bus and take them for certification. See the picture on the left for an example a 70 seater conversion. 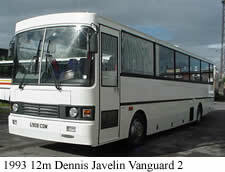 Here we have converted a 1993 Dennis Javelin Vanguard 2 with double rear doors. These are particularly popular with schools as they are ideal for morning and afternoon contracts as well as the school trip, which is usually 2 classes (60 children) and 10 adults. Many Education Authorities and parent groups are now insisting on this type of bus to replace ageing double deckers that are much slower and also do not have the added safety aspect of seat belts.